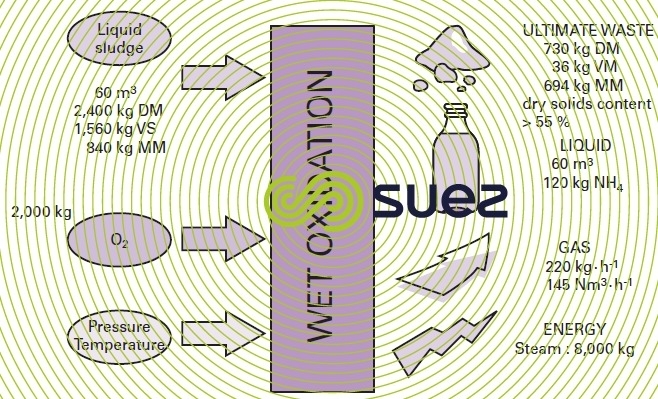 Ammonia treatment constitutes one of the critical points in a wet oxidation unit. It can be carried out inside or outside the reactor. This method requires a specific catalyst and/or stripping inside the reactor. When a heterogeneous catalyst is used, enabling NH3 → NO3 oxidation to be carried out, this catalyst will be subject to stringent temperature conditions inside the reactor and its effectiveness may be reduced due to contamination by certain compounds present in the sludge. Additionally, when it has been depleted, the reactor has to be shut down so that it can be replaced. Ammonia stripping inside the reactor is only possible in a system using a phase separation reactor and the pressure must be lower than the water vapor pressure at operating temperature in order to optimise ammonia transfer to the gas phase. This stripping calls for high pH conditions and, therefore, sodium hydroxide will need to be added. Accordingly, the stripping reaction cannot be thorough and the abatement level will be noticeably lower than that achieved with an external treatment. The oxidised liquor will still contain high levels of NH4+, above 500 mg · L–1 and more often in the region of 700 to 800 mg· L–1. Furthermore, ammonia will then be found in the gas that will have to be processed in order to comply with standards on ammonia discharged into the atmosphere. On these grounds, we have prioritised the processing of ammonia nitrogen outside the reactor. There are two sufficiently proven treatment solutions available: biological treatment or physical-chemical treatment. After the mineral residue has been separated out and the oxidised liquor cooled, this liquor can be processed in a dedicated biological unit that covers nitrification and denitrification. In this case, we need to include the capacities of the tanks needed and this is not cost-effective in most cases. VOC destroyed to produce CO2 and H2O by means of a second specific catalyst installed in series with the first. 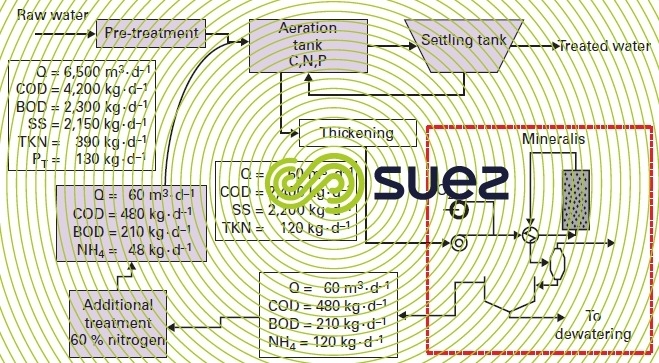 This process has become feasible due to the high levels of ammonia; it was successfully trialled in the Orbe (France) plant. It produces ammonia concentrations in the returns that can drop to below 150 mg· L–1 and thus preserve easily biodegradable COD to assist with denitrification or biological phosphorus removal at the main plant. temperature and pH are used to control stripping effectiveness and to adjust this stripping to the wastewater treatment plant capabilities. 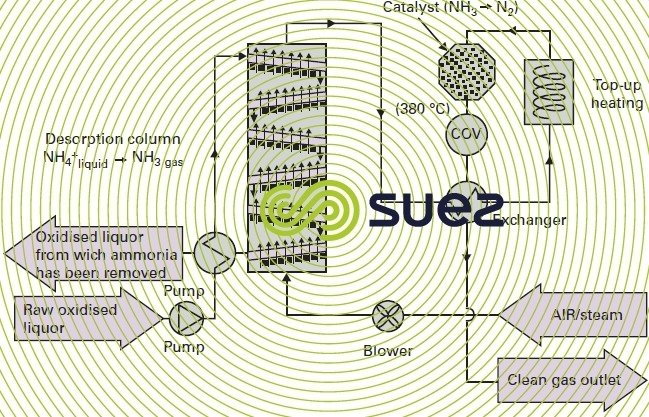 Figures 52 and 53 illustrate the Mineralis process in its external ammonia processing and catalytic reaction option and also its integration (materials balance) into a 40,000 PE wastewater treatment plant.